For help with Pali pronunciation, this is a companion to the book Introduction to Pali, 3rd edition, by A.K.Warder. 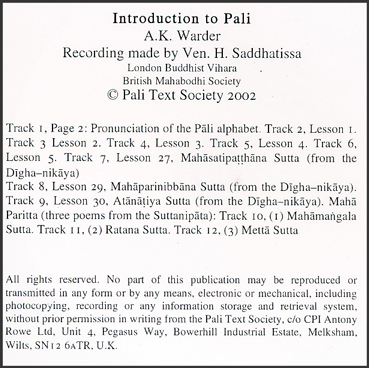 Find streaming audio files of Introduction to Pali online here. Good CD to accompany the book. Clear and easy to understand. Sadhu! Sadhu! Sadhu! I am very eager to learn the pali.